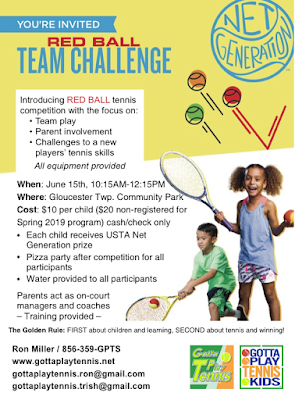 What is RED BALL Team Challenge? The RED BALL Team Challenge introduces low-pressure competition in order for players to try out their new tennis *skills. It includes the use of QuickStart tennis courts and equipment while emphasizing simple rules and scoring for short matches against multiple opponents. This event also promotes team spirit, sportsmanship and camaraderie, and it utilizes parents/guardians as coaches and/or on-court managers (training provided). Event-ending family pizza party allows all to celebrate and share their achievements with others. *Player must be able to: drop-hit a Red Ball or serve to start play; maintain a rally, on most points, of two or more hits. No previous tournament experience required. Need something different and unique? Want your gift to stand-out from the rest? Give someone the gift of the lifetime sport! OFFER EXTENDED TO FEBRUARY 28TH!